This isn’t really much of a Shakespeare story but I’ve been starved for content lately. This weekend my family was on a mini-vacation and saw a sort of travelling Pirates museum, sponsored by National Geographic, about the wreck of the Whydah. As you might expect, I spent the time looking for Shakespeare references! But alas, the time frame here was more 1700’s, so not a lot of Shakespeare to be found. Pirates even performed plays on ships. The Whydah crew staged a play about a mock pirate trial called The Royal Pirate. A group of crewmembers, the worse for drink, missed the first act. 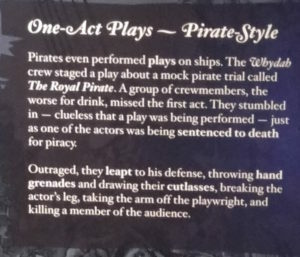 They stumbled in — clueless that a play was being performed — just as one of the actors was being sentenced to death for piracy. Outraged, they leapt to his defense, throwing hand grenades and drawing their cutlasses, breaking the actor’s leg, taking the arm off the playwright, and killing a member of the audience. I think the visual is hysterical, though I can’t imagine how that worked in reality. Just how drunk were they that it never dawned on them that they were watching a pirate trial on a pirate ship where judge and jury were all their fellow pirates? ‹ PreviousHappy Halloween! Or, How Could They Not Get This?